Do you read the news? Are you aware that Finland is the happiest place on earth (the USA is only 18th in the rankings)? Even though their suicide rate is 13 percent higher than ours (the United Nations, the folks who create the survey, attribute that to the long winters and the ubiquity of Ikea furniture), they live in a place that is “the most stable, the safest and best governed.” Apparently their banks are better than ours as well. Of course, they don’t have baseball or Miami, so there! The Finns haven’t always been so carefree, however. 150 years ago, when they suffered the last natural famine in Europe, they were under the boot of the Russian empire. It wasn’t until 1917, in the chaos of the October revolution, that they were able to assert their independence. An integral part of their independence fight and the maintenance of the freedom they won has been their fierce Ski Patrol, defending their north eastern border against the always-hungry “Russian bear.” Remarkably, since its official inception in 1917 to today, the Finnish Ski Patrol has had a Photo Corps, charged with capturing and preserving documentation of their struggle to keep their nation free. I have managed, through a friend I will call “Demetri”, to protect his identity from Finnish authorities, to acquire some of their very rare and valuable cameras, specially adapted for use on the snowy terrain of the frigid far north. 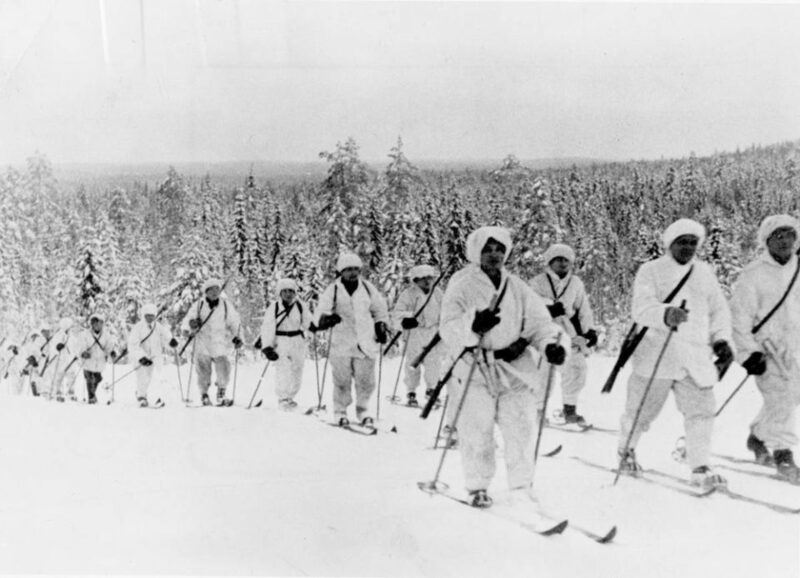 The Ski Patrol Photo Corps was active in covering the Finnish defeat of Soviet forces during the Russian invasion in the winter of 1939-40. The first model I have is a camouflaged Kodak 120 box camera circa 1917, the first camera used by Finnish forces (most of their military spending went to procure weapons and ammunition, mostly from Britain and the United States). It has been said that George Eastman himself, founder of the Eastman Kodak Company, visited Finland and took the first order from General Carl Gustaf Emil Mannerheim, commander of Finnish forces in their struggle for independence. This model was used until 1928 when Finnish forces switched to the A120 folding Kodak camera. The autographic feature of the camera and film in the A120 folder allowed the photographer to make notes on the photograph itself by writing with a stylus through an opening on the back of the camera. When Autographic film was discontinued in 1932, the Finnish war department is said to have purchased 10,000 rolls. At any rate they continued using the autographic feature through World War II and used it to document their successful efforts to hold off Stalin’s army of over 400,000 troops. It wasn’t until 1968, at the height of the Cold War, that Dr. Edwin Land, according to our sources, journeyed to Finland to offer the Ski Patrol a special deal on his new line of Polaroid Instant cameras. These proved to be immensely popular with the Photo Corps who, to cope with the long development times suffered during the bitter northern winters, would place the developing print inside their white parkas until they were ready to be viewed and notes written on the back. These cameras were employed until the stocks of Polaroid type 108 film held by the Finnish Department of Defense were exhausted shortly after the Polaroid corporation’s final bankruptcy filing in 2008. In 2009, a new deal was finalized when Haruo Murase, the chairman of the board of Canon, paid a visit to Finland and offered a deal on the then 4 year old Canon EOS 5D full frame digital camera. The Ski Patrol Photo Corps is rumored to have purchased 150 of these cameras along with Canon EF 28-135mm IS lenses, all of which were camouflaged with the signature Ski Patrol white finish. Canon even improved upon the special white lens coating pioneered by Polaroid on their Model 104 cameras by remanufacturing the 28-135 lenses they provided to the Finns with a “nival-crystal coating”, according to our insider at Canon. Canon's secretly produced Finnish Ski Patrol model 5D and 28-135 IS with "Nival-Crystal Coat." The most remarkable thing about the special cameras provided the Finnish Ski Patrol to aid in their protective efforts of the Finnish people and all that makes them happy, is the secrecy surrounding the cameras themselves. The Finns have been perfectly willing to share the results of the photo documentation their freedom fighters create, but have never been willing to discuss the equipment they use. All requests by journalists for information on these remarkable cameras are ignored and direct questions to Finnish officials are answered either with a stony silence or a denial that their cameras are different from anyone else’s. It is worthwhile noting that in the entire 101 year history of the Finnish Ski Patrol’s Photo Corps there has never been a photograph made of any Finnish military personnel holding one of these cameras. In fact, my source within the Ministry of Defense informs me, all cameras removed from use are destroyed to prevent them falling into unauthorized hands. As you will see from the photos I have of these certified Ski Patrol cameras, their strategies were insufficient to effect that end! Note: due to the sensitive nature of the artifacts discussed in this article, and the presence of Finnish operatives throughout the world dedicated to keeping them out of the public eye, I cannot reveal the whereabouts of these highly unusual cameras.